The good news? The Hunger Games made $155 million at the box office its opening weekend, making it the third-best debut in North American box office history. The bad news, however, reflects a level of idiocy that we weren't really expecting. As CNN reports, "Only Harry Potter and the Deathly Hallows Part 2 and The Dark Knight — both sequels, with the strength of a franchise behind each — recorded bigger opening weekends." Plus, unlike those two flicks, Hunger Games was written by a woman and stars a woman (much as we love JK Rowling, her series isn't named after Hermione) — making it a true lady-centric blockbuster franchise. Now as you may know, Katniss, the main character in the book and film, was described as having "straight black hair" and "olive skin." It's a post-apocalyptic world, so she could be a mix of things, but some pictured a Native American. Blonde-haired, blue-eyed Jennifer Lawrence won the part and dyed her hair dark. But when it came to the casting of Rue, Thresh, and Cinna, many audience members did not understand why there were black actors playing those parts. Cinna's skin is not discussed in the book, so truthfully, though Lenny Kravitz was cast, a white, Asian or Latino actor could have played the part. The boy tribute from District 11, Thresh, has the same dark skin as Rue, but the resemblance stops there. He's one of the giants, probably six and half feet tall and built like an ox. Dark skin. That is what the novelist, the creator of the series, specified. But there were plenty of audience members who were "shocked," or confused, or just plain angry. The tumblr Hunger Games Tweets has collected a smattering of Twitter postings, with the goal of exposing "Hunger Games fans on Twitter who dare to call themselves fans yet don't know a damn thing about the books." What people are saying is disappointing, sad, stomach-churning, and just plain racist. This young woman considered the movie "ruined." This girl wants to know why they "made all the good characters black." Good people cannot possibly be black. Black people are villainous. Duh. At least this person had the good sense to hate himself. 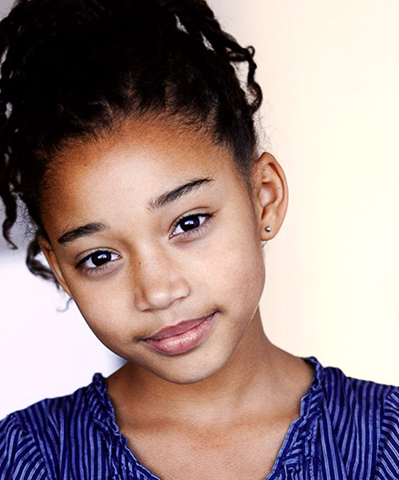 The actress Amandla Stenberg literally looks like a tiny angel, but this movie-goer equates blonde with innocence. A little black girl is not automatically innocent, no. Only a little white girl. Actually, only a blonde. Update: As of 7:00 PM, it looks like the vast majority of these insightful folks have either shut down their Twitter accounts or made them private. Au revoir.